As many of you know, I (Wendy-the-non-cake-maker) am presently trying to master the science of baking in order to make my best friend’s wedding cake next month (eeeek!). Despite having purchased the aptly named Cake Bible and having read it cover to cover, all is not going smoothly. In what way? you ask. In many ways, I tell you. Humour me whilst I tell you about a conversation D and I had last week. No matter how many times I read and re-read it, it made absolutely no sense to me whatsoever. It appeared to be suggesting that something big required less baking powder and that sounded like madness to me. Seeing my distress and knowing me well enough to understand it was caused by sheer frustration rather than any real ailment, D asked if he could help. “Well, not unless you can tell me what this crap means!” I sobbed and read him the paragraph. After listening carefully D breezily announced that the writer was, as she had stated, talking about the principles of surface tension and that it was really a simple concept. Sceptically, I listened to my science teacher boyfriend’s explantion. It seems that the smaller an object is the greater its surface area proportionally. “But it’s smaller.” I was confused. I imagined that and giggled. Suddenly it became clear. Baking powder makes cakes airy and big cakes can’t cope with too much air beacause their surfaces are (proportionally) smaller giving them less support. Therefore you need less baking powder (proportionally) to make an elephant than you do to make a mouse. Eureka! Buoyed by my new understanding of baking I decided to take on the cake challenge yet again. I had a lovely sounding recipe for “white butter cake” and I had made a list of hints from the exceptionally knowledgably Ms Levy Beranbaum. Unfortunately, implementing all of her advice was not as simple as I had hoped. Use aluminium cake pans – Couldn’t find those. Make sure the cake pan is the same height as the cake you want to make – couldn’t find those either. Make sure your baking powder is not out of date – that baking powder has a shelf life was new to me. Checked my tin and, yup, expired 2005. Bought new stuff. Use “cake flour” – this doesn’t exist in the UK. I used Tipo ’00 instead. It’s very fine. Make sure all ingredients are room temperature – ok doke. Ensure your oven is the right temperature – checked and it is. 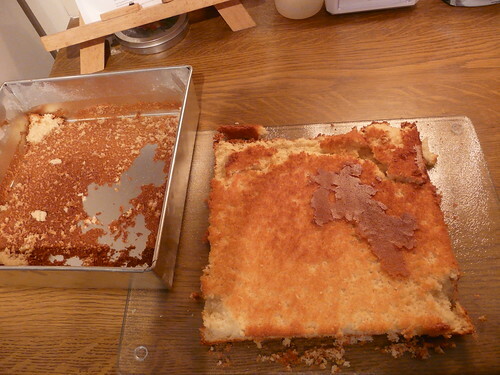 Rub cake tin with clarified butter, dust with flour and line the bottom with baking paper. 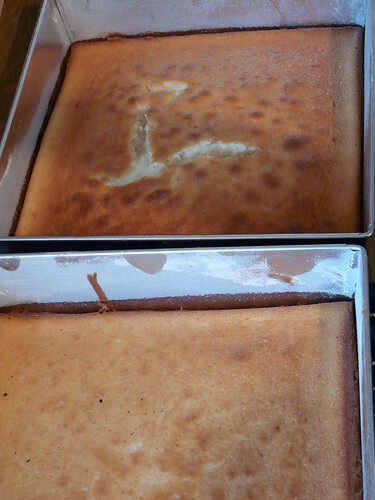 Cook cake in the centre of the oven. When cooking large butter cakes ensure you cool them thoroughly before turning out. With all this good advice and a carefully worked out recipe (more about that another day), I felt sure my next baking attempt could not go wrong. But go wrong it did. See for yourself. On the bright side, knowing where I went wrong means I know what to correct and the parts of the sponge that cooked well were absolutely delicious. That’s progress! This entry was posted in Food, The Wedding Cake. Bookmark the permalink. I’d suggest using self raising flour rather than type 00 flour. SR flour will help your cake rise without extra baking powder. Type 00 flour (ie “strong”) is good for things like pasta (in particular) or bread (where you have yeast as a rising agent). I’ve not worked out what Americans mean by “cake flour” but I’ve never used anything but SR flour and I’m a reasonably competent cake cook! And baking paper … just crucial … 🙂 If you can find (I’m not sure if it exists) a loose bottomed square or rectangular pan, that might help as well. Spring-form tins for circular cakes are just the best: you use the baking paper in the base, and you can just loosen the edges of the cake to remove the tin, before inverting & peeling off the paper! I’d also recommend SR flour. I wouldn’t use anything else in a cake unless the recipe specifically calls for plain flour. That’s out of habit rather than an indepth scientific cake-baking knowledge, but still! Tipo 00 is plain flour so your cake won’t rise as much as one using SR would. Also, from looking at your tin, it doesn’t seem to have a very good non-stick surface. This makes a huge difference! Also, the newer and more expensive tins tend to have better, more even heat conduction, which in turn helps the cake to cook more evenly. Aluminium pans are good but so are the non stick ones you can buy in most kitchen stores. Good tins just make life easier. Wendy – I think you are doing the right thing in just trying lots of cakes – cooking is so much instinct – I have been baking cakes from a young age and some of what your cake baking bible says seems foreign to me but I just know what works for me (most of the time). The more you bake the more you will just know. And remember your icing can cover up a multitude of imperfections! I was taught that when I learnt to decorate cakes at school. And I find my oven does not heat evenly so halfway through baking I often turn around cakes or swap shelves if doing more than one. You can substitute all-purpose flour for cake flour–just use a little less. One cup of cake flour = One cup of all purpose flour minus two tablespoons. p.s. that excerpt from your cake book would have made me cry, too! I forgot to mention–I used to have a teeny-tiny oven a couple of apartments ago, and I had terrible luck baking more than one of anything at a time (more than one sheet of cookies, two layers of a cake, etc.). I think maybe you’d have better luck if you baked them one at a time. I admire your persistence! I have a dread of baking – not sure why, as I don’t remember having any particular disasters – so I tend to sit back and admire the work of others. In your shoes, I think I would have given up by now. Good on you for sticking at it – I’ll keep my fingers crossed for your next attempt! Goodness – that cake book sounds terrifying! Who’d have thought it was so complicated – I’m not suprised you were reduced to tears. I’m with the others – self-raising flour and a good, heavy non-stick cake tin with a loose bottom. Oh – and baking paper. Glad the good bits were delicious though – you are nearly there! Also – I always have problems when I cook more than one cake in the oven at the same time. I’d cook them one after the other, I think. Thank you for all the advice everyone!! Alex – You are so right – the baking paper is essential, I now know that much! 🙂 The 00 flour is the closest to cake flour available in the UK. As I’ve been using an American recipe book (which I suspect may be complicated things!) I’ve been using the closest replacements for some recipes. Jane – Think you might be right about my cake pans. Will see if I can get a hold of others… I can’t use SR flour for this particular recipe as it includes baking powder. Think I’ll try a recipe soon that calls for only SR flour rather than adding baking powder to a plain fine flour like 00. Salena – Thank you! Im going to try cooking them individually today. Antonia = It is a scary book but the woman certainly knows her stuff. Only problem is the ingredients don’t convert very well to UK produce. Oh Wendy – I have had the same problem a Red Velvet Cake I tried for our Red Hat Society picnic today! It rose up wonderfully then started to crack, just like your photo, and then when cooked I let cool in the tin. Imagine my horror when I went back to it 10 mins later to find it had sunk to a thin layer!! Did not wish to try the recipe again and resorted to a tried and trusted Marble Cake of my Mum’s. Doubled the recipe to 6 eggs and in a cake tin with loose sides. Beautiful. Iced and decorated and relished by our Red Hatters this afternoon. Only funny side was I forgot to take the paper off the underside and we all had to peel it off as we cut into it – oops! Cake is one third plain butter cake mixture, one third cocoa and mixed spice, one third coloured pink. I would be happy to send recipe if you wished. Best of luck for your next cake. Wendy, I haven’t baked anything for a while (so tempted, but I will stay clear of it for a while). But I do wish your next try will be fab! Oh Wendy! I sympathise with you! The flour is definitely a problem though, ’00’ is best for pasta but I think too much for cakes. That’s about the sum of my baking knowledge right there I’m afraid. I am fairly hopeless. You are right though, you know where you went wrong and you can do it!! Wow, you’re baking your best friends wedding cake? Thats a great gesture! I wish I could help you here. I’m still wanting to be a better baker and cake maker, so all your trials and tribulations here are certainly helping me out! Thanks for sharing this. Oh Wendy I do sympathise with you! I would use Self-raising flour it saves trying to adapt to how much baking powder or even baking soda to plain flour. I would cook one sponge at a time to keep the oven at the right temp. If you want to use cakeflour Wendy and how to adapt for U.K. not ever finding it here – for every cup of plain flour take out 1 tbsp and add 1 tbsp of cornflour. But using cakeflour you would have to have baking powder and or baking soda for the rise. The baking tin I would use a good non-stick greased with melted butter and fully lined with greaseproof paper – base and sides. I like the loose bottomed ones better for turning a cake out. Do you know one of the best things lakeland does is greaseproof inserts for cake and loaf tins. They are well worth the money and save all the faffing about trying to get your greaseproof paper to fit! Anh – You are such an expert baker, everything you’ve blogged about has been perfect! Helen – The 00 flour is a point of contention. Some swear by it, some think it’s madness. Rosie – Thank you for all the advice. Think I’ll try the SR flour next time. have you tried lining the tins with parchment paper? I use that for everything, and you just have to peel off the paper. Darls – chin up. You will get there. It’s a scarily sized (and worded) thing the book, but she is a very good baker. Have you thought of emailing her via her blog to check out your queries? Lucy – Ach, I’m enjoying it all heaps. And the book is great. Wish I’d managed to find the UK version though. It would have made a few things more simple to work out. Her website is a treasure trove. Haven’t needed to contact her because the forums are so informative. Good luck with the wedding cake…. I’m not much of a baker myself so I feel for you! Cake flour in the US should be translated to ordinary plain flour in the UK. All purpose flour has a higher gluten content than the plain flour we use in the UK so US cooks sometimes specify cake flour to lower the gluten content. Barbara – Ah, if only it were that easy. 🙂 Cake flour is finer than UK plain flour and is also bleached. Both of these things greatly affect the outcome of the cake, I’ve found, requiring me to change US recipes or just stick with UK one! flour is such a tricky, tricky thing. i have to say that if you’re trying to go from zero to 60 in a short period of time, as you seem to be, using foreign recipes is just going to make it even harder. not only is flour processed and used differently in different places, the wheat itself is different. plain flour in the uk is soft, at least compared to all-purpose flours in north america. if you don’t think that’s a good substitute for cake flour, and want to use an american recipe, using imported flour can be a good option. i don’t know if this is available where you are, but you could try a french type 45 flour. 00 flour MAY be appropriate IF it is intended for baking cakes with. there is so much confusion about italian flour. i can’t imagine how many people must be brought to tears over this stuff! 00 flour is the most finely-ground italian flour, but that tells you nothing about its protein content. you need to rely on what else the package says. if it’s suggesting that you use the flour for pasta, i would take that as a warning. you may may also want to go along to amerrierworld.wordpress.com/kate-flour for a home method of heat-treating unbleached flour to create a substitute for bleached. also click on the post ‘finding the x factor’ – i warn you that it’s pretty heady stuff!